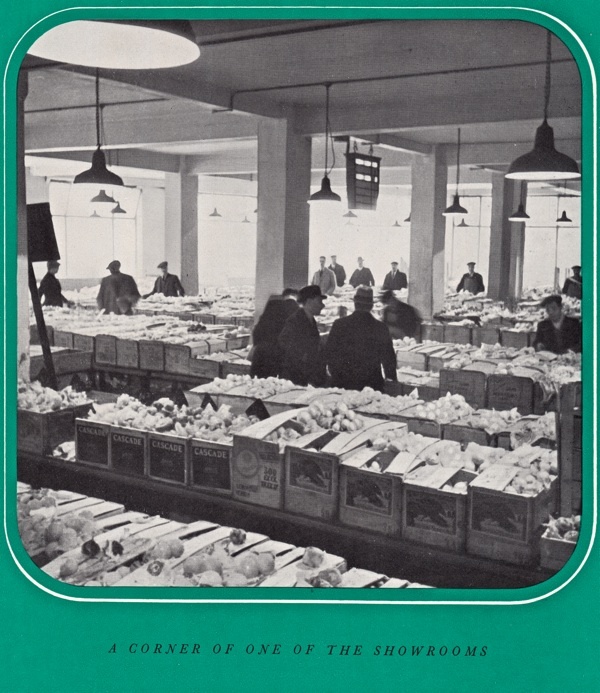 After granting a temporary reprieve in March, Tower Hamlets Council meets today to decide whether to grant permission to demolish the historic Fruit & Wool Exchange in Spitalfields, and I am publishing these excerpts from a brochure to promote the Exchange produced in 1937. You, as a fruit grower, are interested in three things. Growing your fruit. Shipping your fruit. And marketing your fruit. Of these three essentials, the first is entirely your own responsibility, the second is partially under your guidance, and the third? 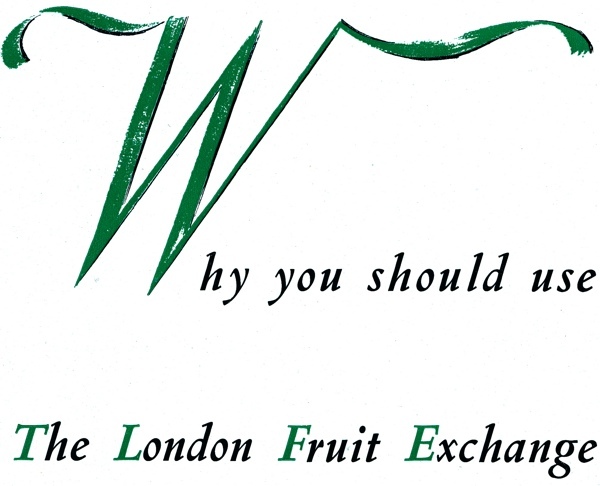 You may ask “Why is the London Fruit Exchange the best place to auction your fruit?” We answer the question in two ways. 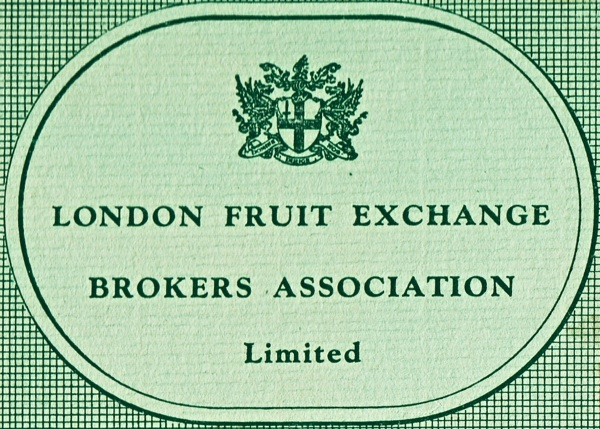 Firstly, we say, “Because the Exchange is the finest example in the world of a specialised fruit distribution centre.” Secondly, we point to the high reputation of the six Brokers who constitute the Exchange - John & James Adam & Co Ltd, Connolly Shaw Ltd, Goodwin Simons (London) Ltd, J.C. Houghton & Co (London) Ltd, Keeling & White Ltd, and Knill & Grant Ltd. One was flourishing back in 1740 and all have unblemished histories of financial soundness and high integrity. And these qualities, being so old are all the more jealously guarded. Here you may be sure of a price that is as high as the market will stand. You may be sure that your fruit will be sold quickly while it is worth the most money. So sure may you be of these things, that, though many thousands of miles may separate you from your ships in the London Docks, you can always be certain that not a penny of your money is being thrown away by carelessness or delay. It is often easier to understand the workings of a business if one knows how and why it was started – and so we will begin our story of the present Fruit Exchange by telling briefly where its roots lie, and how it grew to its present importance. A century ago, there flourished in London four well-known Auction Fruit Brokers. To the fruit trade they were known as “The City Brokers.” With their headquarters at the City Sale Room, they handled a large proportion of London’s fruit business throughout the great industrial expansion of nineteenth century England. 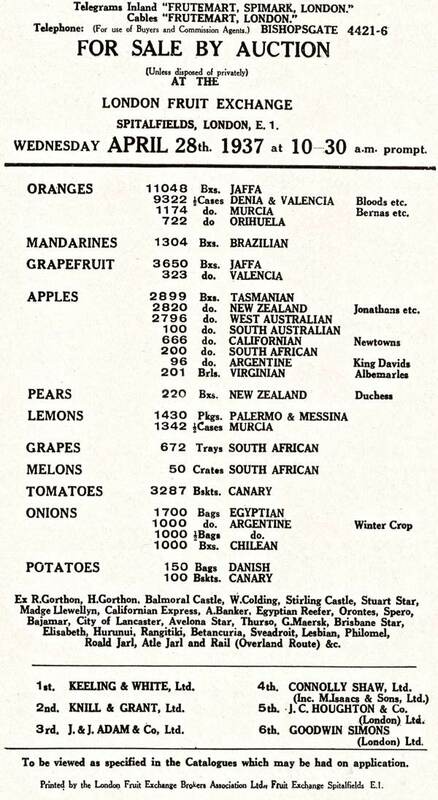 But with the twentieth century came greater and greater consumption of fruit, and in addition, London became a centre of fruit distribution for the Continent as well as the United Kingdom. By 1929, the four Brokers of the City Sale Rooms made a great decision. 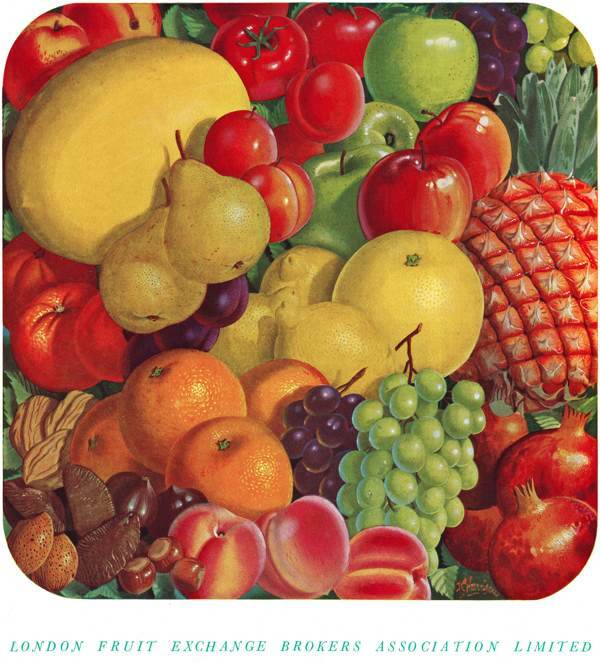 They decided that by intelligent co-operation, it was in their power, and in the interests of the fruit trade, to form a central exchange for buyers and sellers. And so, in conjunction with the Central Markets Committee of the Corporation of London, these six firms organised and caused to be built the London Fruit Exchange. 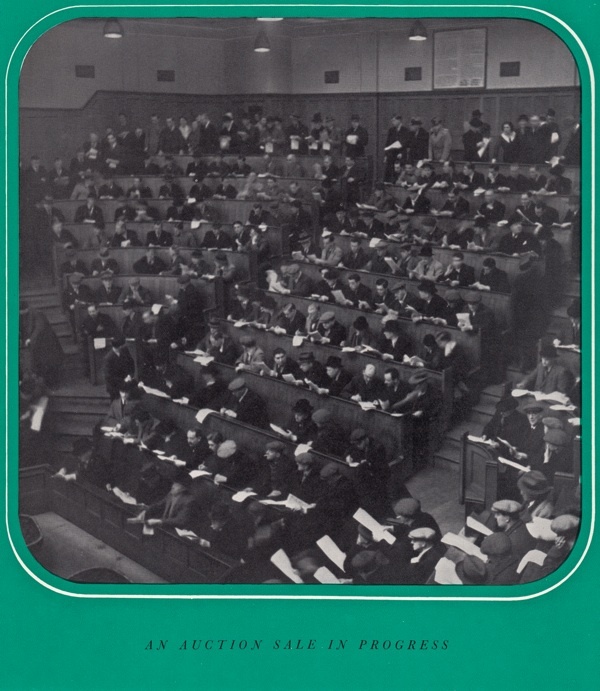 The first auction took place here in September 1929. 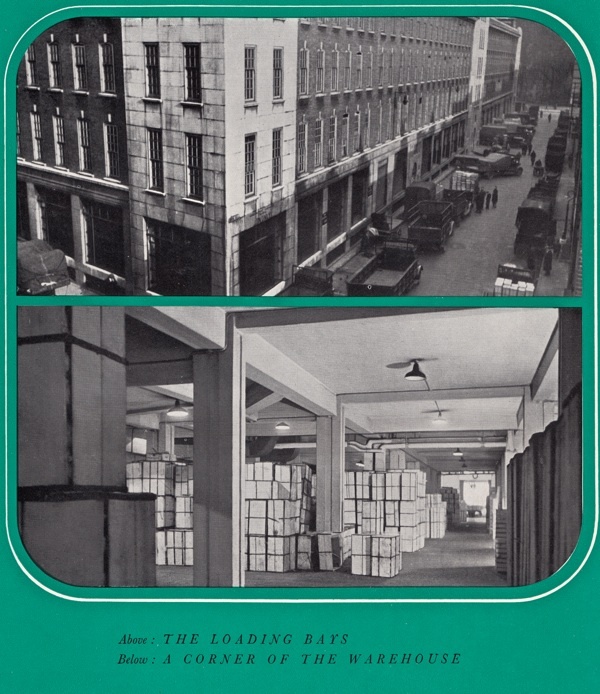 As an example of a specialised fruit distribution centre, the London Fruit Exchange is the finest in the world – in its one building are complete services for warehousing, sampling, buying and distribution, besides social amenities for the buyers who congregate there. Sales by auction are held here on every Monday, Wednesday and Friday. Every sale day of the week, an average of 40,000 and 50,000 packages are offered for sale. On some occasions as many as 100,000 have been catalogued for sale on one day. On the ground floor of the Exchange are spacious showrooms, in which can be exhibited 2,500 sample packages at one time. Here from 8am onwards, the buyers and the auctioneers examine and value the goods before the sales start. The Showrooms are connected with the Sales Rooms by electric indicators, which show at a glance which broker is selling at the moment and in which Sales Room. Immediately adjacent to the Sales Rooms are numerous telephone cabinets connected to a telephone operator. From these, buyers may swiftly communicate with their principals in Great Britain and the Continent to discuss the state of the market. The sales take place from 10:30am in two inter-communicating auction rooms, providing seating for 1,000 buyers. These are fitted with every modern device for making business quick and easy. In each room, the Auctioneers speak into microphones connected to loudspeakers, which bring them into instant touch with every part of the room in which they are selling. The important railways of Great Britain have offices within the Exchange itself, conveniently situated for the immediate use of buyers, and telewriters are installed in the Brokers’ offices which instantly link up with the principal ports of the United Kingdom, giving the latest market information up to the last second before the fruit is sold. By these facilities, and by comfortable seating and central heating, the work of selling goes on smoothly and quickly. The seller has displayed his goods to his best advantage. The buyer is at his ease, and knows that he is dealing with honest men. 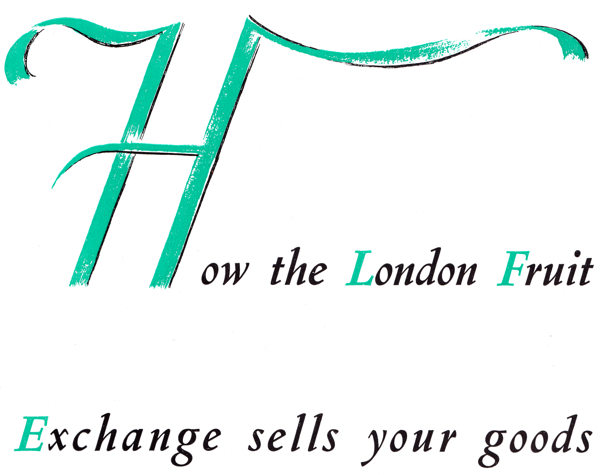 Is it any wonder that prices at the London Fruit Exchange are uniformly good? On the ground floor and basement of the Exchange, is warehouse accommodation capable of holding 200,000 packages. The basement is fed by electrical conveyors, gravity rollers and chutes, from the loading bays at ground floor level. There are fourteen loading bays, each wide enough to take two vehicles per bay. Twenty-eight vehicles can thus be loaded or unloaded simultaneously. Special traffic men are employed to regulate the vehicles, so that immediately a vehicle is loaded or unloaded, it is called out and another takes its place. To do this work, a permanent warehouse staff is employed. During the busy season, it is necessary to employ additional labour, ranging from thirty to a hundred porters daily. At such times, the warehouse opens at 6am, and the business of loading and unloading, piling and sorting, continues smoothly and quickly until 10pm. At times, over 25,000 packages have been received and 25,000 packages despatched in one day. Taking the average weight of a package at 84lbs, this gives a total tonnage handled, piled and sorted in one day of 2,000 tons. All this work is done in a cool, even temperature, maintained on even the hottest days of summer by batteries of electric fans. It’s a beautiful building, and I’ve always thought would be a lovely place to work, lots of light-wells and natural light inside (as I remember from my visit to a little stationary shop inside). Love it! Clarity of vision, confident purposeful prose, and a dash of typographical style. A fitting brochure for a bold venture. Thank you for this wonderful original brochure; it certainly was the “finest fruit auction centre in the world.” Anyone who steps inside now though would be still be dazzled by its grandeur with its parquet floors, luxuriously appointed offices, sweeping double staircase and the light flooding in to this art deco masterpiece by Sydney Perks, the Architect to the City of London. All the high-status architectural details in the Portland Stone elements, the red brick and the sash windows to harmonise with Spitalfields Market and Christ Church. It must be preserved. The Exchange could easily be restored and continue offering work spaces in Spitalfields. Below, independent shops could be created at street level in all four frontages of this 1920′s building – note the large ground floor windows revealed in the brochure. 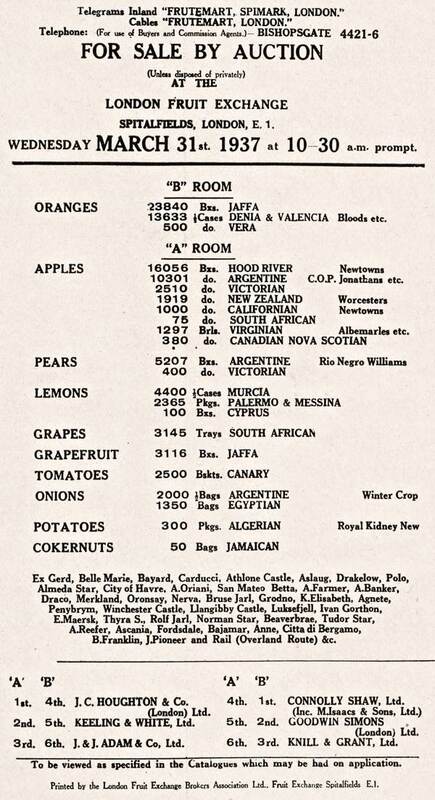 The oranges in this 1937 brochure are a reminder of the 1934 ‘Hitler wrapped oranges’ Exchange story, where 200 buyers stood together to refuse this consignment, wrapped in Spain with images of the Fuhrer. This is one of the best stories of the Exchange, and of the East End…may their spirit be remembered and honoured tonight at Committee. See the good ship “Lesbian” in the brochure…oranges are certainly not the only fruit! The “Oronsay” was still sailing in the 1960′s as a passenger liner (with cargo?) Some east enders may recall these ships. Got to love the “Madge Llwellyn” and the “Egyptian Reefer” too. Wonder if there are any memories out there of these ships, the docks, their cargo and the Exchange? “Cokernuts”?! SAVED!! Thank you, thank you to the GA and to all the wonderful followers of Spitalfields Life who have championed the London Fruit and Wool Exchange. Tonight at Tower Hamlets Strategic Development Committee, every Member voted to refuse permission for the demolition of the Exchange, the Gun public house and the Barclays Bank and Dorset Street. There truly is life in Spitalfields! Thank you. Brilliant… At last, some common sense prevails.. Three cheers for the Development Committee. Wonderful news! I’m so happy to hear this! I heard the wonderful news the other day, hooray, it so deserves to stay! 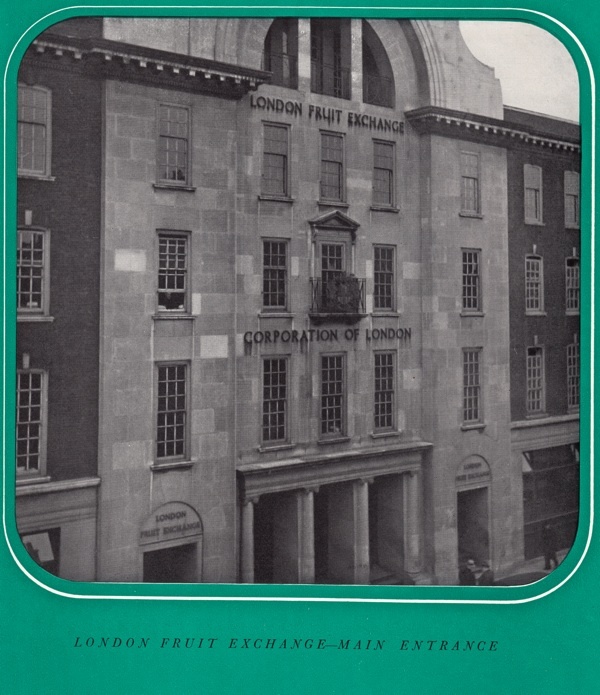 I worked in Spitalfields in the 60′s and 70′s and have many happy memories around the Fruit Exchange (and very near by in The Gun) and the Fruit Exchange building together with Spitalfields church were the pillars of the Market and as the church is preserved so should the London Fruit Exchange. I have many memories of attending the thrice weekly auctions with my late father, David Kira, initially during my visits to the market during school holidays and then in later years in the 60s and 70s when I joined the firm. Also memories of inspecting the samples in the basement prior to the auction commencing. Bidding was in pounds, shillings, pence, halfpennies and even farthings and I rmember my father pouring over his Ready Reckoner checking the figures against invoices received. There was also another company who held regular actions in Spitalfields – J&J Lyons whose warehouse and auction room was based in Gun Street. They had the sole rights in the UK to sell the famous “Eat Me” dates brand. Incidentally, I believe The Orontes was used for the transporting emigrants from the UK to Australia under the £10 passage scheme in the 60s.